This exhibition has been mounted with support from the Louise Lux-Sions Exhibition Endowment Fund, Pew Charitable Trusts, and the Philadelphia Cultural Fund. Recommended monitor resolution: minimum 1024 x 768. If text appears out of place please adjust font size in your browser. In Franklin�s youth, pictures of any kind were scarce, and pictures that rendered the world in living color were almost unknown. Every color image had a huge impact on the mind as well as the eye. The Library Company�s first shareholders were working men of limited means, and they wanted books that combined utility with value for their money. Many of the books they ordered from London were illustrated with copper plate engravings, but none of them were in color. Color was an expensive luxury. Usually it took the form of watercolor added by hand to the printed plates, one at a time. It was not until 1763, more than thirty years after its founding, that the Library Company purchased its first book with color plates. In the early 19th century, books that were beautiful as well as useful became fashionable, and the Library Company began to buy new color-plate books regularly. By mid-century, however, various processes for printing colored illustrations mechanically were available, and the price of color plunged. Books with lavishly hand-colored plates continued to be published, but at ever-increasing prices. As the Library�s book funds struggled to keep pace with an explosion of general publishing and a rapidly growing clientele, the purchase of books with hand-colored plates was drastically curtailed. For this reason, the Library missed out on many of the finest color-plate books of the mid-19th century. Happily, in recent years several splendid gifts have filled many of the most painful gaps. 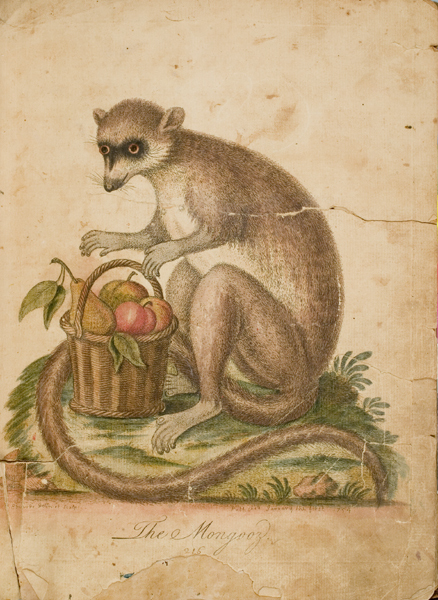 This exhibition surveys the growth of the Library Company�s collection of color-plate books, with a glance at the collectors and librarians who acquired them, from the mid-18th century up to the present. Because the collection is so strong, it is also a sampling of some of the finest color-plate books produced in Britain and America from the 1760s to the 1890s. Once, the country�s appetite for color images seemed insatiable. Today our eyes are jaded, and yet the impact of the best of these color-plate books remains as strong as ever. No reproduction can convey it; they must be seen in the original. George Edwards. Gleanings of Natural History. London: Printed for the Author, 1758. Purchased 1763. The Library Company did not buy its first color-plate book until 1763. It was useful as well as beautiful, and the color was striking, but the deciding factor was probably its local significance. 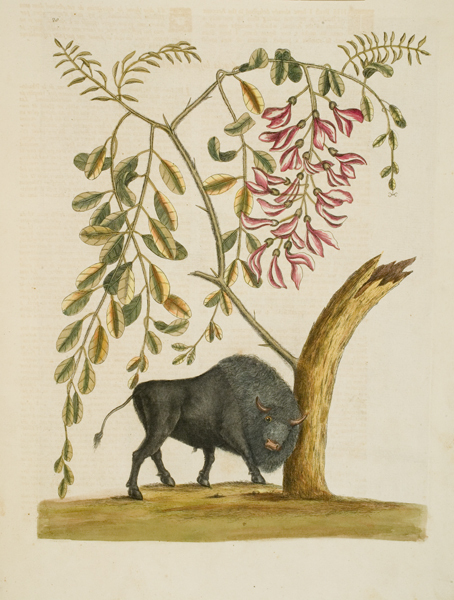 John Bartram had supplied the author with specimens and descriptions of American flora and fauna, and our shareholders must have been intensely curious to see this endorsement of their local genius. They nearly read the book to pieces. Mark Catesby. Natural History of Carolina, Florida, and the Bahama Islands. London : B. White, 1772. Purchased, 1772. The first color-plate book devoted to an American subject, Catesby’s masterpiece was an essential purchase. We missed the first edition in 1732, but when a second was announced in 1752, we ordered a copy. However, our London agent reported that it was too expensive (£18), so the order was not filled. Then in 1772, a third edition was published, and with help from Benjamin Franklin, then in London, we managed to get a copy at last. Pierre F.H. d’Hancarville. Collection of Etruscan, Greek, and Roman antiquities from the cabinet of the Honble. Wm. Hamilton. Naples : [F. Morelli], 1766-1767. Purchased 1772. In the same order of 1772 the Library received this seminal work of neoclassicism. 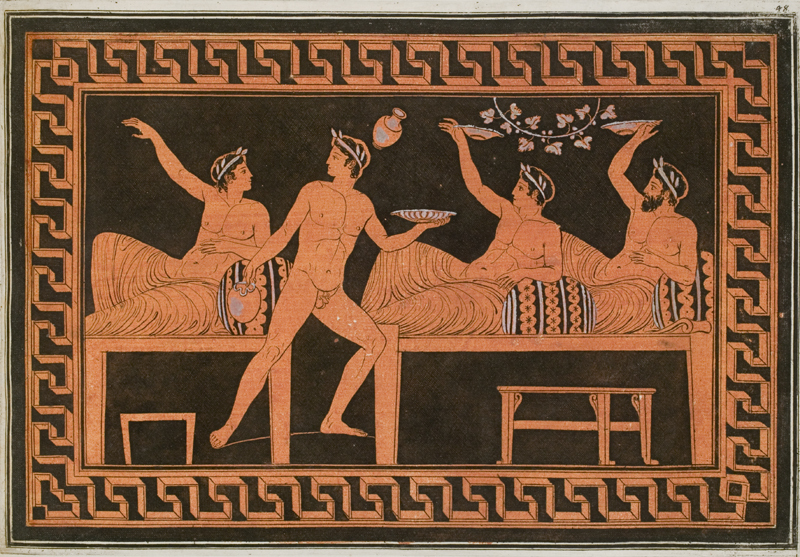 Its engravings of Grecian urns from the collection of William Hamilton were printed in black on a sepia ground with touches of color added by hand . Library Company of Philadelphia. Minute Book. Manuscript, December 28, 1772. 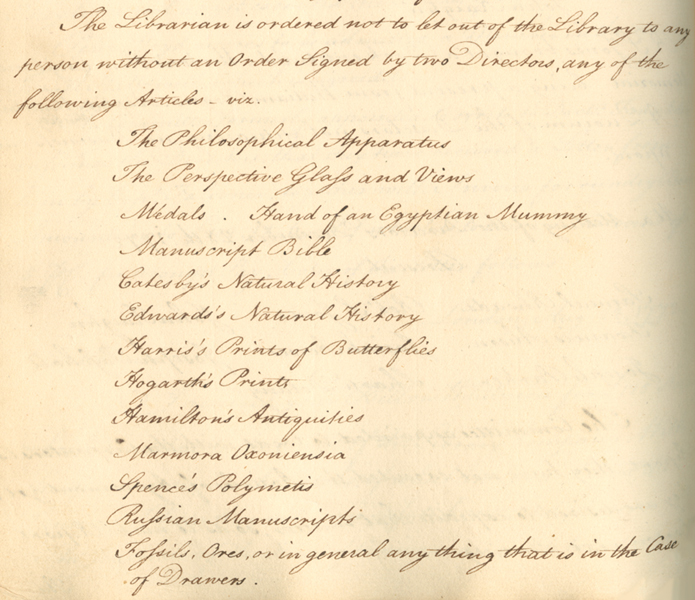 Shortly after Catesby and Hamilton arrived in 1772, the Directors for the first time drew up a list of books that were not to be taken out of the library. It was too late to save Edwards and his battered mongoose. But the new rule helped preserve the two new color-plate books, as well as two medieval manuscripts, three uncolored plate books, and our mummy’s hand, the gift of artist Benjamin West, which is still a favorite with school children.